Fennel may be white or pale green and the stalks have “hairy” green leaves. 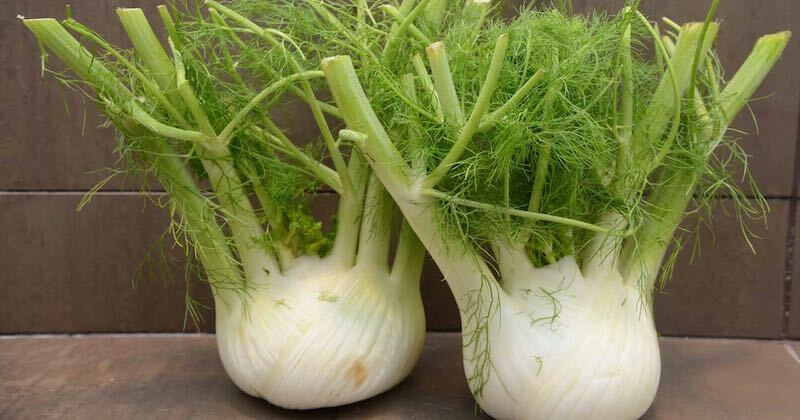 Together with carrots, parsley, dill and coriander, fennel belongs to the Umbellifereae family. Fennel is very rich in vitamin A, C, K and many of the B vitamins. It is an excellent dietary fiber, contains potassium, calcium, magnesium, manganese, folate, molybdenum and manganese. Minerals like phosphorous, iron, zinc and copper can also be found in fennel. Blood pressure: The high potassium content and diuretic properties in fennel helps reduce high blood pressure and thus decreasing the risk for heart attack and stroke. Bone density: Nutrients in fennel have a beneficial effect on loss of bone mineral density and bone mineral content in post-menopausal bone loss and osteoporosis. It works by reducing osteoclast—cells that break down weakened bone—differentiation and function. This offers a protective effect on the bones. Menstruation disorders: As fennel is an emmenagogue, it helps regulate the hormonal action in the female body, easing menstruation flow. See how to include fennel in your juice diet. Relaxes muscles: Fennel can help relax and calm the muscles and nerves in the body. It contains nutrients that are anti-inflammatory and antispasmodic, that can help alleviate cramps in the stomach, legs and muscles, and stop muscle spasms. Water retention: Due to its diuretic properties, fennel is excellent in getting rid of water retention or edema.